In a recent study, researchers found potential human habitat on the moon. 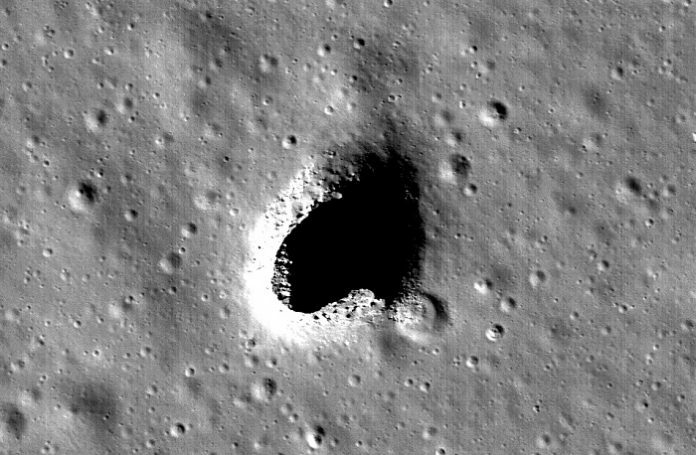 They found a large open lava tube in the Marius Hills region of the moon may protect astronauts from hazardous conditions on the moon surface. The study was done by researchers from JAXA, Japan’s space agency. Previous research has found that the moon surface has extreme temperature variation, radiation, and meteorite impacts. These tough environmental conditions make it hard to stay on the moon for longer than three days. In addition, the moon has no atmosphere or magnetic field to protects its inhabitants. The current study suggests that the safest place to seek shelter may be the inside of one of these tubes. Lava tubes are naturally occurring channels formed when a lava flow develops a hard crust, which thickens and forms a roof above the still-flowing lava stream. Once the lava stops flowing, the tunnel sometimes drains and forms a hollow void. In the study, the team in JAXA analyzed radar data from the SELENE spacecraft to detect lava tubes. The pattern includes a decrease in echo power and a large second echo peak. The team found similar echo patterns at several locations around the hole, indicating there may be more than one. Because the SELENE’s radar system wasn’t designed to detect lava tubes, when the JAXA team decided to use their data, they consulted scientists from the GRAIL mission. GRAIL mission is a NASA effort to get high-quality data on the moon’s gravitational field. Lava tubes exist on Earth, but the ones on the moon are much larger. They found the lava tube near the Marius Hills is spacious enough to house one of the largest US cities. They suggest the information might be more useful than previously expected in future research. One researcher of the study is Junichi Haruyama, a senior researcher at JAXA, Japan’s space agency.